Internal Department of Housing and Urban Development emails obtained by the watchdog group American Oversight reveal pressure within the agency to spend beyond the $5,000 statutory limit on HUD Secretary Ben Carson's office furnishings. Carson is under fire after his office ordered an expensive furniture set for his office, as CNN first reported. But new emails released Wednesday show there was persistent pressure from within the agency to find a workaround to spend more than the $5,000 limit under law -- despite repeated emphasis from some inside the agency that the $5,000 limit is set in stone. Under federal law, Congress must be notified of any executive office renovation exceeding $5,000, and that notification must also go through the Office of Management and Budget (OMB). Notably, one email suggests Carson and his wife, Candy Carson, had some involvement in the furniture selected -- despite a HUD spokesman's previous claim that Carson and his wife "had no awareness that the table was being purchased." The emails mention Carson's wife multiple times as someone who was involved in providing input and making decisions in the refurbishing effort. "I believe Allison has print outs of the furniture the secretary and Mrs. Carson picked," an Aug. 29, 2017, email from HUD chief of staff Sheila Greenwood to HUD administrative officer Aida Rodriguez and executive assistant to the secretary Allison Mills reads. Another HUD employee exchange pointed department officials to a $24,666 quote for a dining room table, hutch and chairs. But that was after six months of deliberation and staffers repeatedly pointing out $5,000 is the legal limit for any office renovations. The order was ultimately canceled after public pressure. Acquiring new furniture for Carson's office was a priority from day one -- and before. On his first official day as secretary, Carson expressed displeasure with the chairs in his office. "The secretary's office called and said he doesn't like his chairs," reads an email from HUD director of facilities management services Mike Schimmenti to Foster and HUD administrator Laura McClure, in an email headed "secretary's furniture request" on March 3, 2017 -- the same day he was confirmed. Before that, on Feb. 13 at 5:43 p.m., Foster emailed HUD finance officer Sarah Lyberg, saying she had been repeatedly asked to find more money for Carson's office. "You will recall that prior to the transition you and I had a conversation about refurbishment of the secretary's office. At that time, you informed me there is a limit of $5,000 for appropriated funds to be spent on furnishing the secretary's office," Foster wrote, attaching the relevant portion of the code. "Subsequent to our conversation, I was again asked about 'finding' additional money for furnishing the secretary's office. I have uniformly responded that we are prohibited from using appropriated funds in this fashion without direct authorization from appropriations in both the House and the Senate. But since the issue continues to be raised (and folks keep telling me how admin "always" finds more money for this) I thought I should reconfirm with you. Is there any way admin could appropriately spend additional funds over $5,000? to provide new furnishings or decorating for the secretary's office without getting appropriations approval?" Two hours later, Lyberg responded definitively: "We cannot exceed the statutory cap." Asked if HUD stands by its earlier statement that the secretary was unaware of the purchase of a costly table, HUD Communications Director Raffi Williams said, "When presented with options by professional staff, Mrs. Carson participated in the selection of specific styles." Williams did not answer a follow-up question as to how that addressed the original question, and did not answer a question about whether there is any concern at HUD about how the furniture endeavors did not take up valuable HUD employee time. The messages also show HUD officials were asked if the agency could spend federal funds to install a home security system for the Carson residence in February, before he was confirmed. "Another question: I have also been asked to pay to have a security system installed at the secretary's private residence. Can you advise as to whether or not this is allowed?" Foster wrote to other HUD employees on Feb. 13, 2017. Kenneth Free, director and special agent in charge of HUD's Protective Services Division, pointed to a Washington Post story showing images of the outside and inside of Carson's home from a real estate site, without the address, saying that story could be used as justification for a home security system. Yet another HUD employee informed his colleagues four requirements would have to be met in order to justify such an expenditure for a home security system, primarily that the system is crucial for Carson to perform his duties and chiefly beneficial to the agency. The Carson family eventually paid for the system from personal funds. The emails also reveal Carson, months into the furniture deliberations, was interested in possibly using money not for furnishing things, but to hang pictures of past secretaries instead. "I am waiting to hear back from Mrs. Carson regarding her coming into the office to give input on redecorating the secretary's office, however I spoke with the secretary today and he had a question," wrote Carson's scheduler Jacie Coressel to Rodriguez on Aug. 9, 2017, at 1:31 p.m. "Does the money have to be used for furniture? He noted that if possible, he would like to use that money to have pictures hung of secretaries who are missing from the portrait hall outside his suite. If you have questions give me a call!" 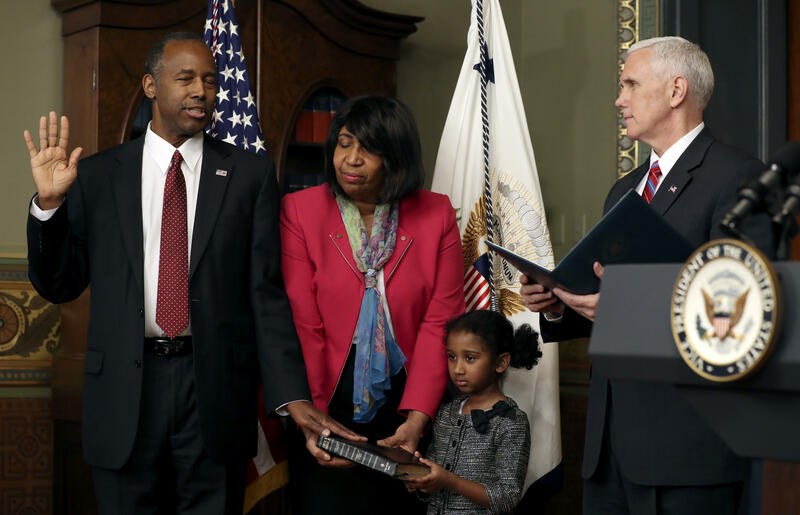 Carson, a neurosurgeon-turned-speaker who threw his hat into the ring during the 2016 presidential cycle, has previously come under scrutiny for involving his family in HUD business. Carson called for an independent review after reports emerged that his son was involved in a HUD listening tour, against the recommendations of HUD lawyers. But Carson is far from the only secretary whose office expenditures have drawn scrutiny. Veterans Affairs Secretary David Shulkin and Interior Secretary Ryan Zinke have raised eyebrows over travel expenses, and Health and Human Services Secretary Tom Price resigned last year after Politico revealed he was using charter planes for much of his travel.